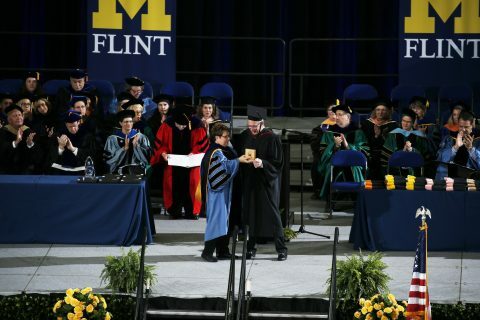 Nearly 700 University of Michigan-Flint students celebrated their graduation Sunday at the 2018 Spring Commencement. Their talents, compassion, and achievements were honored at two ceremonies April 29 held at the Dort Federal Credit Union Event Center. 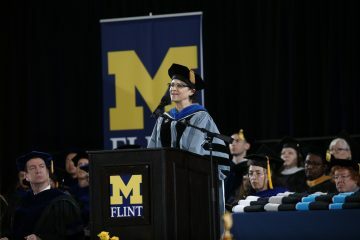 Chancellor Susan E. Borrego congratulated the graduates for their successes at UM-Flint, and for being difference makers in the community as curious and talented individuals. “You have made an impact in the community and I know you will enhance our legacy,” Borrego said. Jones is a Professor of History, and the Society of Black Alumni Professor at Johns Hopkins University. 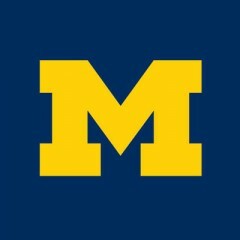 She was a faculty member at the University of Michigan in Ann Arbor from 2001 to 2017. Before these achievements, Jones told Sunday’s crowd she quit her university studies twice, partly due to fear of failure and having doubts. It was her third try in which she developed a sense of belonging and purpose. 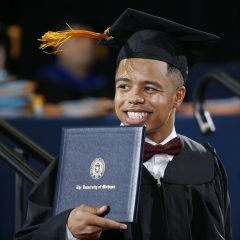 Professor Jones urged the graduates to ignore any doubts and resistance others try to place on them. 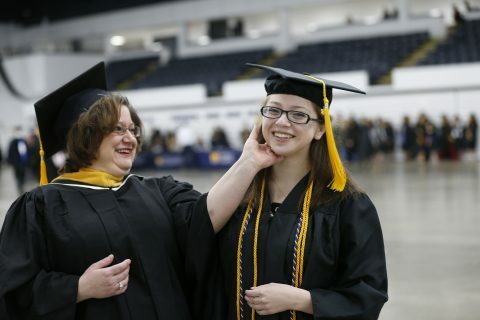 Madison McCrue (left) received her bachelor’s of business administration; her mother, Toni LaRocco (right), is a faculty member in UM-Flint’s School of Nursing. 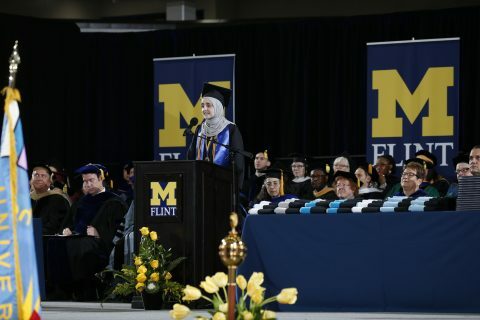 Morning student speaker Noor Abdalla, graduating with a Bachelor of Science in Biology, urged her fellow graduates to use their opportunities for good. Abdalla, from Flint, has several family members from Syria who are now refugees around the world. Noor Abdalla, student speaker for the morning ceremony. 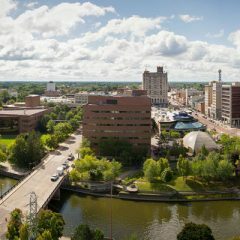 Abdalla celebrated UM-Flint’s campus culture. 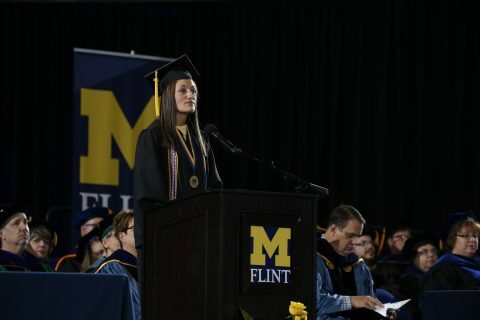 Afternoon student speaker Danielle B. Emerson, graduating with a Bachelor of Science in Nursing, encouraged her fellow graduates to learn from failures. Danielle B. Emerson, student speaker for the afternoon ceremony. Emerson also encouraged graduates to embrace the opportunity to step outside of their comfort zone. At the afternoon ceremony, the university awarded Philip R. Hagerman with the Medal of Excellence for Leadership and Service. Hagerman co-founded Diplomat Pharmacy Inc. with his father in 1975, a company which grew to be the nation’s largest independent specialty pharmacy, and, in 2014, a publicly traded company on the NYSE. He founded SkyPoint Ventures in 2013 and remains its CEO. Philip R. Hagerman received the Medal of Excellence for Leadership and Service. Hagerman said he is looking forward to even more collaborations with the university. The day was filled with great enthusiasm. Monique Wilhelm (left) is a member of the Chemistry and Biochemistry faculty in the College of Arts and Sciences (CAS). Her daughter Catherine Wilhelm (right) received her degree from CAS at the April 29 ceremony. Jamie Trussell, who earned her education specialist degree, said it was special to graduate with her peers in the program. After the morning ceremony, she summed up the energy and excitement of the day.